Most people are familiar with the fact that the North Carolina General Assembly has been returning to Raleigh for a seemingly endless series of “special sessions” to deal with the last minute whims of conservative legislative leaders. Fewer people, however, are aware that right-wing legislative wheels have continued to turn during the periods in which the lawmakers have been officially adjourned. 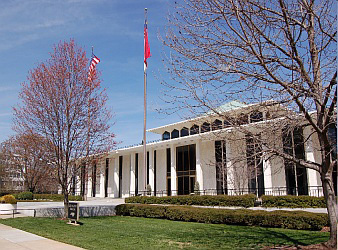 Lawmakers have, of course, always returned to Raleigh during legislative downtimes to convene study committees charged with digging into issues more thoroughly than time permits during the regular legislative sessions. This year, however, the study committee process is notably different. Rather than dealing mostly with sober and wonkish discussions of technical issues, conservative lawmakers have decided to turn several study committees into platforms from which ideologues employed by right-wing “think tanks” can promote extreme proposals for eviscerating government itself. Last week, as we reported on The Progressive Pulse , leaders of the once staid and sober Revenue Laws Study Committee turned the panel into a virtual three-ring circus that featured a lengthy philosophical lecture from a Washington-based corporate lobbyist and a grandstanding and cynical interrogation of a state official. Justice Center Senior Counsel Harry Payne has more on the latter offensive sideshow in this opinion piece in today’s edition of Raleigh’s News & Observer . Yesterday, conservative lawmakers took another foray out onto the fringe. The setting was a study group known as the House Select Committee on Public-Private Partnerships. The concept of the “public-private partnership” or “P-3” as the speakers at yesterday’s meeting frequently referred to it, is not necessarily a problematic or controversial. In many ways, the P-3 is just another way of handling and modernizing that time-honored but often-flawed institution known as the government contract. As the final speaker at yesterday’s event – a consultant from one of the giant law/lobbying/consulting firms that dominate the political scene in so many state capitals  – made clear, the P-3 is frequently just a way for government to obtain efficient and cost-effective private sector assistance in constructing essential public infrastructure. By making private contractors “partners” and giving them a stake in the outcome of, say, the construction of a highway, the public can reap real benefits. Unfortunately, mere efficiency and effectiveness in the development of public structures and systems weren’t all the first two speakers at yesterday’s meeting had principally in mind. Both of these men – the “Director of Government Reform” at the Koch-Brothers-funded Reason Foundation  and the “Director of Fiscal Policy Studies” at the Locke Foundation  – came not just to praise P-3’s, but to attempt to bury government. In a series of moments that would have undoubtedly warmed the hearts of the Kochs, Art Pope and their other extremist patrons, both men trumpeted P-3’s as a means of privatizing core public structures and services. Whether they were championing private prisons, privately-owned highways or even museums, both sought to advance the notion that publicly-owned and controlled structures and services are inherently inefficient. One of the most telling points of the meeting occurred when the Reason Foundation speaker touted the experiment being pursued by a wealthy Atlanta suburb that has essentially outsourced or privatized a huge proportion of what people have normally come to think of as core public services . In the Reason/Locke/Koch/Pope vision of society, this is the Holy Grail: a world in which public structures and systems as we have come to know them would, literally, not exist. Instead, government would function as a skeleton operation in which a small handful of public employees would spend most of their time contracting with private corporations and/or selling off public assets. According to the Locke staffer, North Carolina should sell off billions in public assets – everything from open land to parking facilities to prisons to the state aquariums so that they can be transformed into profit-making entities. “Beneficiaries of waste,” he said, are the only opponents of such an approach. The only problem with this vision, of course, is that it is an absurd fantasy on several levels. As humans have learned through centuries of trial and error (from the feudal era and before right up to the modern day criminal syndicalism of post-Soviet Russia), a world in which core public structures and services are privatized and controlled by a handful of wealthy oligarchs (or corporations) is no model for a just and healthy society. It is instead a way to assure that democratic controls will be minimal and that opportunity will be controlled and meted out by the rich and powerful. It is, in short, a gussied up version of the plantation model of society – something that, given the obsession of so many on the right wing with telling and retelling the stories of old white men in wigs and knickers , may not be so surprising. Perhaps even more importantly, it is a cynical model in which everything is commoditized; a vision of society in which wealth and profit and personal aggrandizement are the sole objectives and in which things like the common good, shared sacrifice and the simple and wholesome psychological benefits of public spaces and institutions that belong to everyone and to no one are casually tossed aside. It is, as is always the case with modern far right, a world in which “the market” is treated as a deity to be worshiped rather than as what it is: a powerful tool created by and for humans. There weren’t a whole of questions or statements from the members of the study committee at yesterday’s meeting. One that stood out, however, was from a conservative Democratic Representative named Bill Owens . Owens is a member of the small group of conservative Democrats who, to the great frustration of progressives, voted with the GOP to pass this year’s disastrous state budget. He is no liberal. But Owens also voiced skepticism at some of the testimony and confronted the Locke Foundation staffer on his rosy description of prison privatization. Owens explained that North Carolina had already tried this route in recent decades and found it wanting. Owens said that while P-3’s might be helpful in prison construction, turning the essential public function of running prisons into a profit-making enterprise was not the direction our state needs to head. In the months and years ahead, let’s hope Owens’ skeptical sentiment holds sway amongst lawmakers of all stripes – both when it comes to the use of P-3’s and during the inevitable attempts by the far right to use them as a means of pushing their ultimate goal: selling off our government. From the looks of things, if the people running the General Assembly get their way, this is a battle that we we’ll have to fight sooner rather than later.